Over 140 pages, The Nurburgring Guide covers everything from the best line round Karussell to arranging a tow vehicle or renting a helicopter! There is a dedicated section just for the F1 Nurburgring circuit then a separate section within the Nurburgring Guide for the Nordschleife (The Ring). The whole 21km circuit is then broken down into 9 handy sections, or sequences of corners labelled A-I. As you get more familiar with these sections you can then look at the final section which looks at each individual corner. This final section in the Nurburgring Guides contain not only detailed information on each corner, but also a ‘top tip’ for each corner, a quick one line summary of the most important thing to remember. The Nurburgring Guide is written by professional racer Ron Simmons who first went to the The Nordschleife in the mid 80’s. Ron now runs his own race school on site and has countless hours of knowledge and experience of the circuit in all weather conditions. He literally is on the circuit nearly every day. With tips on overtaking points and lap strategy the Nurburgring Guide will make sure you get the most out of your visit to the most famous track on earth. 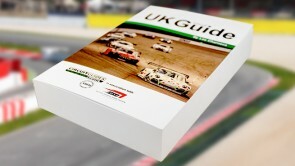 Once there hopefully you will not need to read the wet weather section that we include in The Nurburgring Guide for you.